Fibrenew International is pleased to announce our new Master Franchisee in Australia, Mr. Dean Carroll. Dean comes from a background in accounting and will now head Fibrenew’s operations in Australia from his office in the Melbourne area. 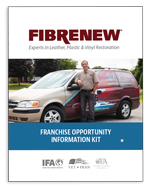 Fibrenew has exceptional franchise opportunities available throughout Australia. For more information, please contact us at 1.300.954.812 or info@fibrenew.com.au. We look forward to speaking with you!